A long drive to Edinburgh was met with freezing temperatures as we finally got the long awaited British winter. Some of the players did enjoy the snowy weather with a snowball fight on the drive up! Arriving for the 4pm kick-off, with a strong squad and good numbers, the Lions were hopeful of a result, deservedly after such a long journey. The Lions started the match well, the defence held strong soaking up the pressure and the midfield competed with Hotscots to keep the possession. The first goal came to the Lions, thanks to Asher D’s close range shot paying off at the 25 minute mark. This was just the start the Lions had been looking for throughout their season and so the players were feeling positive. However, the Lions’ defence was soon caught out, their high line provided Hotscots with a chance which the took, the score now sitting at 1-1. With an equaliser waking the team up, the Lions continued to cause the hosts problems all over the pitch, the effort and desire on show was great to see. Even the opposition’ manager commented after the game that “The Lions were the better side in the half and fought with tremendous desire”. 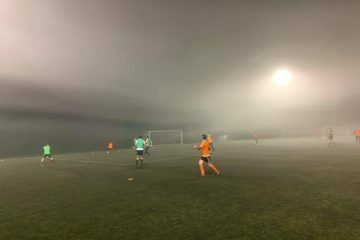 Testament to the hosts who were well spirited throughout both the match and the night out afterwards, a big thank you from everyone at the club! Both teams came out in the second half with something to prove and nothing to lose, however it was Hotscots who would find their form early on with flowing passing moves that piled the pressure on the Lions. The Lions, seemingly on the back foot, continued to fight for the ball. The scoreline held thanks to Craig F-B who collected the ball nicely and made some crucial saves. Within the last 20 minutes, the Lions began to tire, the long journey takings its tole saw the hosts go ahead. Hotscots now lead 2-1. A combination of frustrations and tiredness saw Adam W make a late tackle, resulting in a red car, a first for the Lions after 211 games and nearly thirteen years of playing! Adam W, however, had a commendable game and should not be disheartened with this. With time running out, Hotscots scored again, placed high in the top left corner out of the reach of Craig F-B. The score finishing 3-1 to the hosts, but the Lions undeterred thanks to their fighting spirit throughout the game. Big thank you to Hotscots for being welcoming hosts, both on the pitch and off, we’ll certainly be back for the night out at least! The Lions now look to their next few league games to claim some much deserved points, these can be found on the Fixtures page of the website. 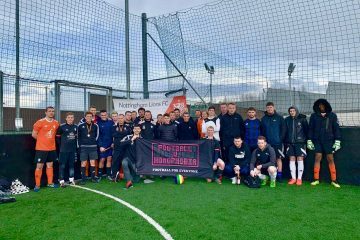 The month of February sees Football celebrate its annual month of action, Football vs Homophobia, which looks to fight discrimination against the LGBTQ+ community within football and its’ wider communities. 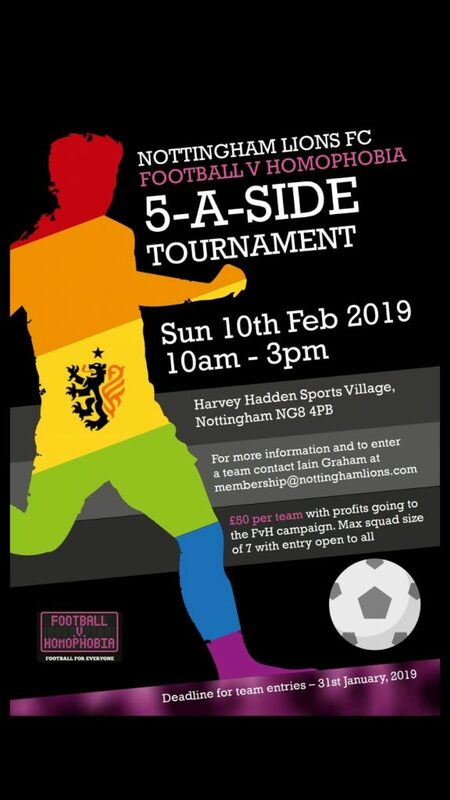 In celebration of this, the Lions will host a 5-a-side football tournament, with all profits going to the Football vs Homophobia campaign. If this is something you’d be willing to get involved with, please don’t hesitate to get in touch with us either using the comments section of the front page of this website or via our social media platforms. Thank you for taking the time to read this and we wish you a positive week!